Traditionally styled with a large round knob and shapely guides, this handsome surface bolt may be used at the top of a stationary door or as a horizontal privacy bolt. 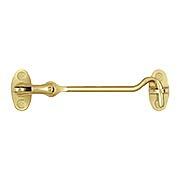 Finely crafted from solid brass and available in 7 popular finishes..
With a large round knob and shapely guides, our 6-Inch Traditional Style Surface Door Bolt coordinates with virtually every style of hardware. 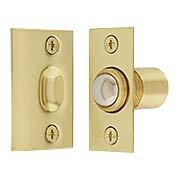 Finely crafted from solid brass, it features a unique ball-bearing system and three mounting options. With a large round knob and shapely guides, our 8-Inch Traditional Style Surface Door Bolt coordinates with virtually every style of hardware. 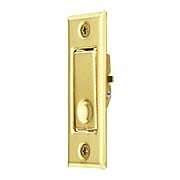 Finely crafted from solid brass, it features a unique ball-bearing system and three mounting options. With a large round knob and shapely guides, our 12-Inch Traditional Style Surface Door Bolt coordinates with virtually every style of hardware. 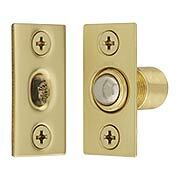 Finely crafted from solid brass, it features a unique ball-bearing system and three mounting options. With a large round knob and shapely guides, our 18-Inch Traditional Style Surface Door Bolt coordinates with virtually every style of hardware. 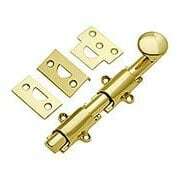 Finely crafted from solid brass, it features a unique ball-bearing system and three mounting options. Traditionally styled with a large round knob and shapely guides, this extra long surface bolt is ideally suited to 8' or taller doors. 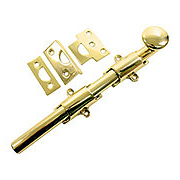 Finely crafted from solid brass, it features a unique ball bearing system and strikes for three mounting options. 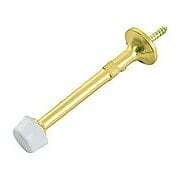 Our solid brass flush bolt is an understated alternative to more decorative surface bolts. Mounted on the inside edge of the stationary door, it fits perfectly flat to the door surface. Choose from 7 popular finishes to match your door handles and hinges. This mid-century door stop has a straight, squared stem capped with a white rubber button. 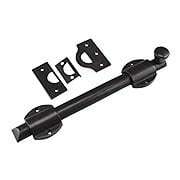 It's easily installed on the door or baseboard with the attached screw. Made of solid brass in your choice of 4 popular finishes! 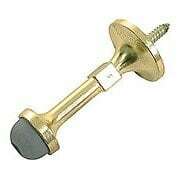 Economical zinc doorstop for use with loose pin hinges. This useful double sided door stop is mounted directly on to the door hinge. The amount the door opens is adjustable. Includes rubber tips (color may vary). When economy is a priority, consider this die cast zinc door stop. 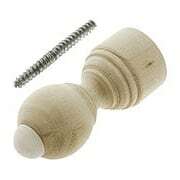 The tapered shaft features a decorative and useful square band - simply grasp it to screw the doorstop into place. A rubber bumper caps the end. Hardwood door stops were popular in the Victorian era. Turned from solid mango wood this shapely reproduction can be stained, varnished or painted to match your baseboard. Easily installed with the included lag screw. When economy is a priority, consider this die cast zinc door stop. 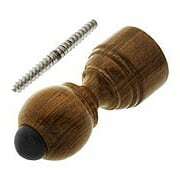 The tapered shaft features a decorative and useful square band - simply grasp it to screw the doorstop into place. A white rubber bumper caps the end. 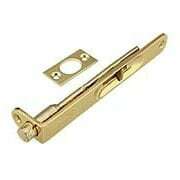 This is a handy device for use as a privacy lock on pocket or sliding doors that do not have a lock installed. 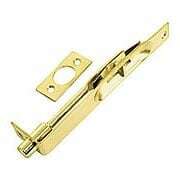 This pocket door jamb bolt is designed to be face mounted at the rear of a closed pocket door, acts as a privacy bolt to prevent door from opening. It works like a rocker switch. When pushed in, the other half pops out, physically preventing the door from returning into its pocket. 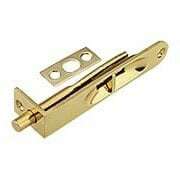 This top-quality solid brass doorstop mounts directly onto a loose-pin hinge. 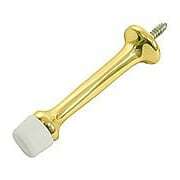 Simply remove the pin, place it through the hole in the door stop, then re-insert it into the hinge. The amount the door opens is adjusted by shortening/lengthening the threaded arm. Choose from 10 classic finishes. 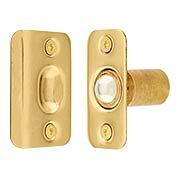 Our solid brass 4" flush bolt is an understated alternative to more decorative surface bolts. Typically mounted on the inside edge of the stationary door, it fits perfectly flat to the door surface. Choose from 9 popular finishes to match your door handles and hinges! Our Small Square-Corner Ball Catch is the perfect solution for securing narrow interior doors typically used on French doors, closets, pantries, and those with a dummy door set. 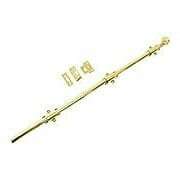 Made of solid brass, this low-profile mechanism features a sturdy spring, and is adjustable for varying door gaps. Choose from an array of popular finish options. Our Square-Corner Ball Catch is the perfect for securing narrow interior doors, including French doors, closets, pantries, and those with a dummy door set. 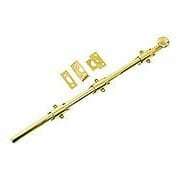 Made of solid brass, this low-profile mechanism features a sturdy spring, and is adjustable for varying door gaps. Choose from an array of popular finish options. Our Solid-Brass 4" Flush-Mount Door Bolt is an understated alternative to more decorative surface bolts. Mounted on the inside edge of the stationary door, it fits perfectly flat to the door surface. Choose from an array of popular finishes to match your door handles and hinges. Our Rounded-Corner Ball Catch is the perfect for securing narrow interior doors, including French doors, closets, pantries, and those with a dummy door set. 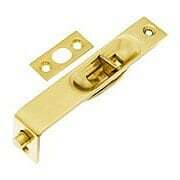 Made of solid brass, this low-profile mechanism features a sturdy spring and is adjustable for varying door gaps. Choose from an array of popular finish options. This Eye Loop and Eye is an excellent choice as a replacement for a worn or broken Hook and Eye. It is designed to work with our items RS-01DH-CHK4X and RS-01DH-CHK6X. 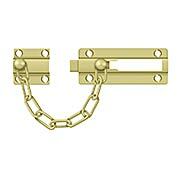 Made of solid brass, it comes in an array of classic finishes. 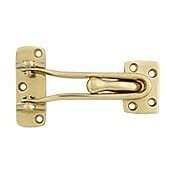 Our unique 4-Inch Hook and Eye works on shutters, gates or even doors. Use it to hold them open or securely closed. 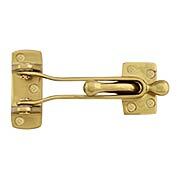 Made of solid brass, it comes in an array of classic finishes. Our sturdy 4-Inch Swing-Arm Guard provides extra security while allowing your door to be partially opened for viewing or ventilation. 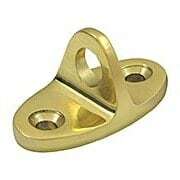 Made of solid brass, it comes in an array of popular finish options. Our sturdy 5-Inch Swing-Arm Guard provides extra security while allowing your door to be partially opened for viewing or ventilation. 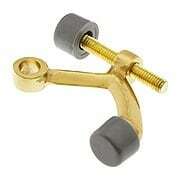 Made of solid brass, it comes in an array of popular finish options. With its rustic, yet refined presence, our 12-Inch Solid Bronze Heavy-Duty Deadbolt suits a variety of styles, from Traditional to Urban. The hand-applied finish ages gracefully, with frequently touched areas exposing the natural shades of the bronze, while other areas oxidize further. The result? An elegant and timeless display of contrasting color variations. Handcrafted from the finest-quality materials, each piece has its own, unique character and provides smooth, long-lasting operation. 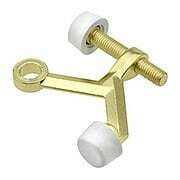 This extra-large bolt is ideal for use on heavy doors. With its rustic, yet refined presence, our 18-Inch Solid Bronze Heavy-Duty Deadbolt suits a variety of styles, from Traditional to Urban. The hand-applied finish ages gracefully, with frequently touched areas exposing the natural shades of the bronze, while other areas oxidize further. The result? An elegant and timeless display of contrasting color variations. Handcrafted from the finest-quality materials, each piece has its own, unique character and provides smooth, long-lasting operation. 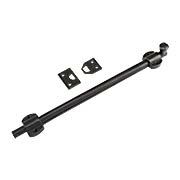 This extra-large bolt is ideal for use on heavy doors. With its rustic, yet refined presence, our 12-Inch Solid-Bronze Surface Bolt suits a variety of styles, from Traditional to Urban. The hand-applied finish ages gracefully, with frequently touched areas exposing the natural shades of the bronze, while other areas oxidize further. The result? An elegant and timeless display of contrasting color variations. Handcrafted from the finest-quality materials, each piece has its own, unique character. 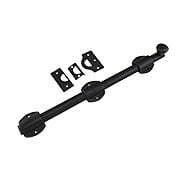 As versatile as it is functional, it is suited for use on windows and doors. Comes complete with one universal strike and one mortise strike.